Astronomy Science ~ NASA's Cassini spacecraft has documented the beauty of Saturn and its surroundings for more than a decade. 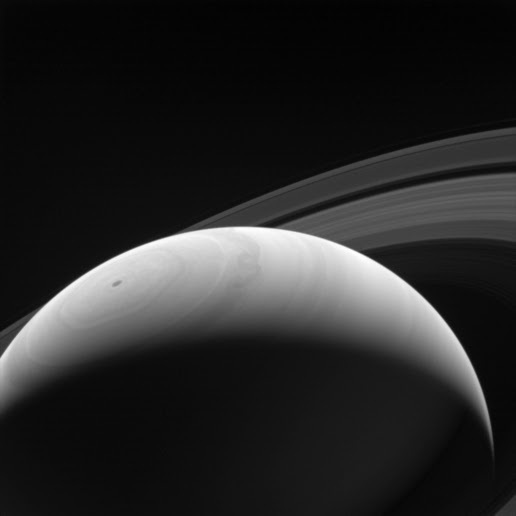 More recently, the Cassini spacecraft sends a lovely new images showing the sunrise on Saturn. Day and night process occurs more rapidly at Saturn in the appeal of our Earth. NASA estimates that the rotation period of Saturn takes only 10 hours and 40 minutes, which would completely disrupt your sleep cycle if you try to live on Saturn. (But man can not live there). Cassini took pictures near-infrared wide-angle camera in August 2014. The spacecraft is about 1.1 million miles away from Saturn when the images were taken. Saturn interesting line pattern derived from the strong winds that make ribbons of clouds. Clouds are visible in the upper atmosphere of Saturn are made of ammonia ice. Winds in Saturn can go more than 1,100 mph. Although launched in 1997, Cassini apparently still healthy and will continue to study Saturn and its moons next few years.